Landscape painter, muralist. Born in Waverly, Missouri on August 21, 1875. Puthuff studied at the Art Institute of Chicago before moving to Colorado in 1889 to study at University of Denver Art School. He arrived in Los Angeles in 1903 and for 23 years worked as a commercial artist painting billboards while painting landscapes in his leisure. In Southern California, he lived in Eagle Rock, La Crescenta, Corona del Mar, and La Canada. After 1926 he was able to abandon commercial art and devote full time to fine art and exhibitions. He is nationally famous for his lyric interpretations of the Southern California deserts. Puthuff died in Corona del Mar on May 12, 1972. Member: California Art Club (cofounder); California Watercolor Society; Laguna Beach Art Association (cofounder); Painters and Sculptors of Los Angeles; Palette and Chisel Club, Chicago; Pasadena Society of Artists; Salmagundi Club; San Francisco Art Association; Southern States Art League. 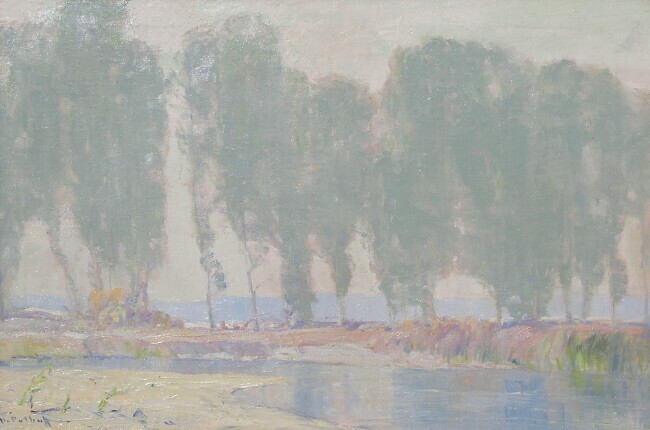 Exhibited: Del Monte Art Gallery, 1908-12; Alaska-Yukon Exposition, Seattle, WA, 1909; Los Angeles County Museum of Art, 1914, 1917, 1929; San Francisco Art Association, 1916; California State Fair, 1930; Biltmore Salon, Los Angeles, 1930-40; Golden Gate International Exposition, San Francisco, 1939. Awards: Bronze medal, Paris Salon, France, 1914; silver medals, Panama-California Exposition, San Diego, 1915; first prize, California Art Club, 1916; medals, California State Fair, 1918, 1919; first prizes, Laguna Beach Art Association, 1920, 1921; second prize, Southwest Museum, Los Angeles, 1921; medals, Painters of the West, 1925, 1927, 1930; silver medal, Pacific Southwest Exposition, Long Beach, 1928. Works held: California Historical Society, San Francisco; Hackley Museum, Muskegon, MI; Irvine Museum; Laguna Art Museum; Laughlin Theater, Long Beach (murals); Los Angeles County Museum of Art; Orange County Museum of Art, Newport Beach; Pasadena Art Institute; Springville Museum of Art, UT; Municipal Collections of Denver, CO and Phoenix, AZ.